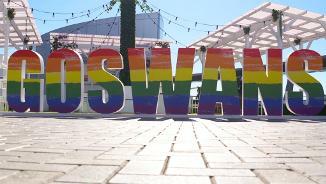 The Swans recently announced the Club will take part in this year’s Mardi Gras Parade, in what’s believed to be the first float entered by a professional sporting team. It follows Swans players and coaching staff taking part in the parade in recent years, joining athletes from other sporting codes to say no to homophobia in sport. The entry coincides with the 40th anniversary of the Mardi Gras and follows the Swans hosting the first Pride Game in Sydney for premiership points in 2017. Sarina Jackson, chair of Sydney’s official LGBTI supporter group the Rainbow Swans, has welcome the announcement. A limited number of spots have been allocated to 2018 Rainbow Swans financial members, which were determined via a ballot. All 2018 Rainbow Swans financial members received an email on Monday, February 5 with the details explaining how to enter the ballot. Results of the ballot were sent out on Friday, February 9 to all members who entered the ballot. Successful entrants had until Friday February 16 to complete their registration. We had a great response from all those who were lucky enough to be selected for the Mardi Gras Parade float. That means unfortunately we don't foresee the need to do a redraw at this time. If anything should change, we'll let everyone know. We hope everyone who can will make it out to the Parade route to cheer cheer the red and the white! Otherwise, we hope you'll watch the Parade on SBS and get loud and proud at home! Just like our Pride Round, this is an important step in the Sydney Swans push to play a key role in changing the AFL to be an inclusive and welcoming community for everyone.